WHY IS FINANCIAL INDEPENDENCE FOR WOMEN IMPORTANT? Oxford Dictionaries defines empowerment as ‘making (someone) stronger, more confident, especially in controlling their life and claiming their rights’. There are several organizations, activists and campaigns like Going to School and Sarathi Development Foundation that advocate women empowerment and emphasize on self-reliance of women in our society. Other initiatives like Majlis Legal Center helps victims of violence access their legal rights and provides socio-economic support. While these and other similar organizations have their own approach to empowerment, a critical common thread that lies at the core is financial independence. As defined above, empowerment means giving someone the ability to “control their life and claim their rights”. Financial independence is not only a source of confidence but also gives women the credibility to participate in important matters of decision making, for themselves and their families. This is relevant to both, women from low income communities, as well as women from affluent families, where making women financially independent is not considered a priority. What happens when women are not financially independent? When women earn for themselves, they are immediately more in control of their lives. This is especially important for women who are live in abusive households. It has been reported that 70% women in India face some form of domestic violence. One such form of conducting this violence is by using ‘controlling behavior’ i.e., restricting access to financial resources. Hence, women who face abuse often have no option but to continue living in the same house with their abuser as they lack financial independence, which would otherwise enable them to have a choice. When parents don’t think their daughters should be financially independent, they can choose to neglect their education. This translates into an extremely troubling statistic: in rural India, 1 girl out of 100 reaches grade 12. What happens when women are financially independent? Research shows that when women earn income they reinvest 90% of it into their families, as compared to only 30% to 40% for a man. Read about the empowered Indian woman here. Recent campaigns such as #Heforshe or the #ShareTheLoad that advocate gender equality are examples of changing ideologies. If reading this article has influenced your thinking, then speak to people around you and help them understand the importance of educating girls and giving them the choice to gain employment or become an entrepreneur. We need independent and empowered women. 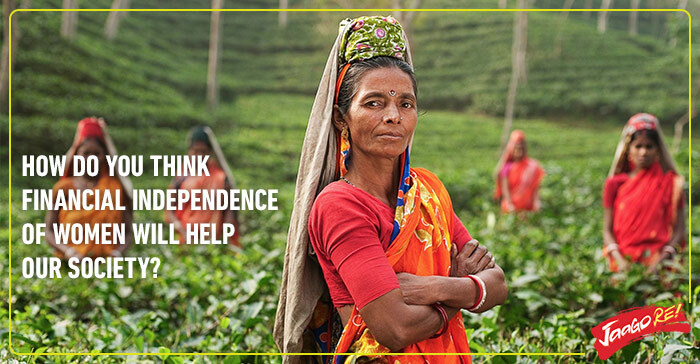 Supporting women to be financially independent is a key step towards that. What steps can each of us take to ensure greater financial independence of women in our society? Share your views with us on our Facebook and Twitter pages, or email us at jaagorein@gmail.com. Anchal provides hands-on capacity building, consulting and grant management services to non-profit organisations across the sectors of sanitation, education and governance.